Started with a new nutritional coach last week that is looking into my microbiome. Wow, I know, I had no idea what microbiome was a year ago much less how to say it correctly! As I have known, just about all diseases start in the gut. Cancer is no differect and if your microbiome is not functioning right, your body is going to have a difficult time repairing. Now, with all that being said…we are testing how my body reacts to different foods. Most of you know I have been on a vegan diet for over a year now. I am amazed by the nutrition found in many of the fruits, nuts, and vegetables most of us are not eating enough of. I have felt great on this lifestyle change. However, I have to be a good student and mind my coach! She is bringing back a little animal protein into my diet to see how my microbiome handles different foods. 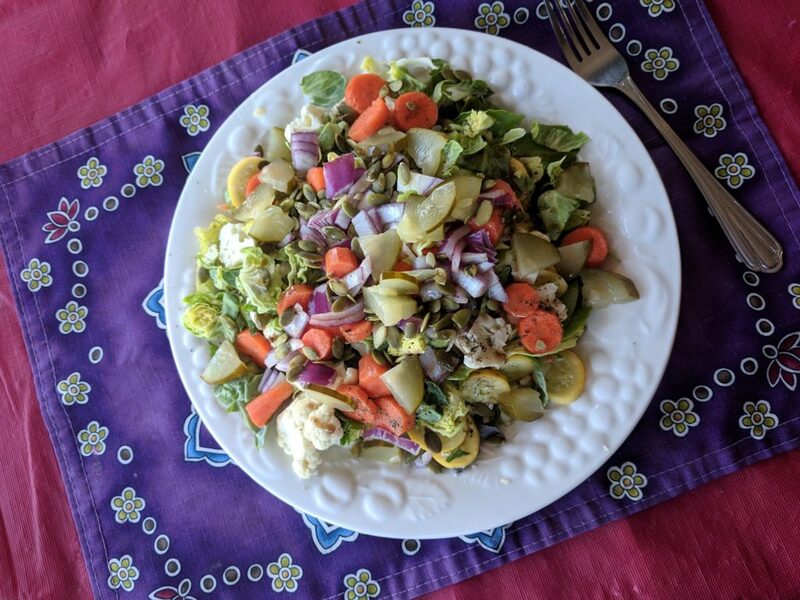 Today’s salad – Chard, Kale, and Spinach followed with Romaine, Chicory Broccoli, Cauliflower, Red Cabbage, Carrot, onion, pickle. Sprinkled over the top with Pumpkin Seeds. Spice it off with pink Salt, Black Pepper, Balsamic vinergette and Apple Cider Vinager. And yes…I added a chopped poached egg!